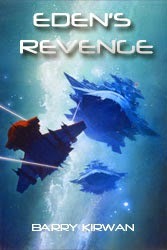 The recent 3-day giveaway led to >900 free downloads of Eden's Revenge between US and UK, so around 300 per day for the three days of the sale. In the Amazon-Free category, the book got to #1 in the UK in two categories - alien invasion and space opera, reaching #2 in those same categories in the US. It also got to #25 in science fiction. So, what does a giveaway bring? Well, first, it opens up the book and the series to a whole new audience - though admittedly many may not read it, or may decide it's not their cup of tea after reading the first chapter. But the chance to outreach to new readers is worth what might otherwise be seen as a loss of potential earnings; there have already been three 5* reviews posted on Amazon since the sale, including one that compares the writing to Frank Herbert's Dune series, with layered plots within plots, surprises and revelations - which I'm very happy about, since Dune was a major influence on my reading and writing, and layered plots is what I go for (because that's how I think the world/galaxy/people work). 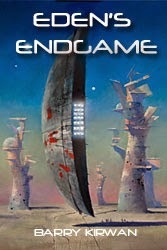 It is also a prelude to the imminent launch of Eden's Endgame, the last in the series - I'm just waiting for the release date which I hope to have after the weekend. In the meantime, if even 10% of those who downloaded it read it, I'm happy, because like all writers, I like to be read.